The purpose of a burner coil is to provide an efficient transfer of heat from the burner flame to the water flowing inside the coil pipe. Many design features help to accomplish this transfer. A coil is enclosed in a coil jacket, or tank. The jacket is constructed of metal and it is generally insulated on the inside to prevent the outside from becoming dangerously hot during operation. The pipe in a coil is spaced to allow the flow of hot air produced by the burner flame, and propelled by the burner fan, to circulate easily and contact the entire outer surface of the pipe. Nearest the burner, a single outer coil of pipe allows a large open space in the center so the flame itself makes minimal connect with the pipe. At the end away from the burner flame, the coil pipe is wrapped into layers in which the pipe is circled around from the outer edge into a small inner circle. Each row that has the pipe wrapped into the inside to form a small inner circle is called one pancake. Each pancake provides addition feet of pipe inside the coil jacket. The more pancakes in a coil, the more pipe surface is exposed to the heat. Water traveling through a coil with many pancakes also has to travel inside the coil longer, so it is exposed to more heat transfer for a longer period of time. Another factor in designing a coil to provide maximum heat transfer is the diameter of the pipe, the large the diameter, the more water is contained inside. The more water inside the coil pipe, the slower it moves through the coil. To understand this think about the water as it flows through the high-pressure nozzle. As the diameter that the water has to flow through gets smaller, the speed at which the water is propelled increases. Conversely, the larger the diameter of the opening or pipe, the slower the water flow. A baffle is a steel plate that is welded to the end of the coil farthest from the burner. The baffle causes the hot air from the burner to deflect away from the jacket outlet initially. The airflow is directed to pass through the openings between the pipes in the coil so the most heat transfer occurs. Most pipe material is either steel or stainless steel, as is the jacket. The schedule of the pipe pertains to the thickness of the pipe wall. The larger the pipe inner diameter, the thicker the wall needs to be to withstand the same amount of pressure. The most common schedule pipe used for pressure washer coils is schedule 80. The most common inner diameters are 3/8″, ½”, and ¾”. Schedule 40 pipe is still used for lower pressures, and schedule 160 is used in some higher-pressure equipment. Generally, the thicker the pipe wall, the greater the longevity of the coil. 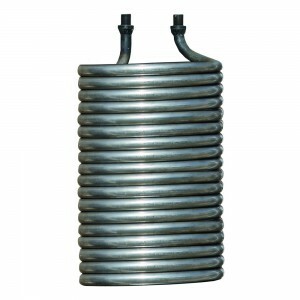 This type of coil has the burner mounted on one end and is installed horizontally on a frame. Because the burner isn’t mounted on the lowest point, water doesn’t get into it and cause damage. The exhaust is commonly routed out the end of the coil jacket that is opposite the burner assembly. This type of coil has the burner mounted underneath and exhausts out the top. The biggest drawback to the vertical coil is that leaks or condensation from the coil piping drains directly into the burner. Water creates problems in the burner including electrical shorts and misfiring of fuel. An advantage of a vertical coil is that the exhaust is aimed up and away from people around the equipment. Some believe the vertical design creates a more even application of the heat to all areas of the pipe because heat rises. Because the heated air is fan forced through either coil design, we find this belief to be groundless. Servicing an oil burner mounted underneath a coil is much less convenient than servicing an oil burner on a horizontal coil. Many times it is helpful to add stovepipe to the exhaust of the coil jacket to route the exhaust fumes out of the area where the equipment is located. If the equipment is permanently mounted in a building, exhausting the burner to the outside is advisable. If the equipment is permanently mounted in an enclosed truck or trailer, it can be exhausted through the roof or the vehicle side. Another option that can be considered with a horizontal coil is to install the equipment with the exhaust port pointing out a door. This eliminates the need for additional piping. It is important to provide a way to exhaust the hot gases out of the area that the equipment runs in. Heat build up, as well as the build up of exhaust fumes around the unit, is detrimental to the equipment operation. Cool fresh air is needed for the engine to operate properly. Heat is also a major factor in ingnitor failure. Never allow a coil to freeze. The coil could crack, and the rest of the equipment could be damaged also. Anti-freeze equipment to protect it from freezing. Whenever equipment is left in storage for more than a few weeks, anti-freeze it. The anti-freeze contains rust inhibitors that will protect your coil. Never allow the burner to operate without water flow. This can damage the coil, and it can cause explosion and personal injury. A coil on a pressure washer that is being run cold for a long time can be anti-freezed and by-passed, which will add to its longevity. If this is done, disable the burner so it cannot be turned on by mistake. A coil on a pressure washer that is being run cold in humid weather will have condensation on the outside of the pipes. This condensation collects in the burner on a vertical coil and in the insulation underneath it on a horizontal coil. Firing the burner occasionally will help to dry things out. Soot builds up on the pipe exterior surfaces from the burner exhaust. The soot insulates the pipe reducing the transfer of heat. Soot can also build up and block air passage around the pipe. Inspection involves removing the burner assembly from the coil jacket and visually examining the coil for soot. If the burner is fueled with kerosene or number one fuel oil soot is generally not much of a problem. If the burner is fueled with number two fuel oil, soot will build up and the coil will need to be cleaned periodically. Adding a soot remover to the fuel oil helps to reduce any build up. If the coil needs to be cleaned, disconnect and remove it from the machine. Pressure wash the coil, using a good degreasing chemical. Let the coil dry then reinstall onto the pressure washer. A coil should be descaled periodically to allow for optimum heat transfer between the hot air and the water. Descaling is a process where acid is circulated through the coil for a period of time. There are products made and sold for this process, and they are recommended. Follow all safety precautions on the product packaging and M.S.D.S. Another acid product that can be used is a 5 to 8% solution of hydrofluoric acid. If you typically use this type of acid and have it on hand, you may want to use it to descale your coil. Hydrofluoric acid is dangerous and aggressive; take every precaution when using this acid. Whichever acid is used, it should be self-inhibited. That means it won’t attack the metal of the coil much, it will primarily work on the scale. Hydrofluoric acid isn’t always self-inhibited. Circulate the acid solution through the pipe for the period of time recommended on the packaging, or if using hydrofluoric acid, for one hour. Do not use the pressure washer pump to circulate acid. That is damaging to the pump and it makes no sense to maintain one component by damaging another. An old pump, or an inexpensive pump that can be sacrificed without losing too much money should be used. Use a circulating pump that is acid resistant. With the acid in a pail, place the pump pick up line into the solution, then connect the pump outlet to the coil inlet. Plumb the coil outlet back to the pail. Run the solution in a loop for the correct amount of time. Next run an alkaline detergent through the coil using the same method. Finally rinse the coil with clear water, and then reassemble the equipment. It isn’t possible to offer an exact amount of operation time to run the equipment before descaling should be done. It depends on the hardness of the water being used, and how hot the water is heated. The hotter the water the more the minerals in it fall out and attach to the inside of the pipe. It is also difficult to judge because inspection of the inside of the pipe is difficult. If the burner runs a lot and the water doesn’t get as hot as it should, scaling may be the problem. Unless there is an identifiable problem, if the equipment is used 30 to 50 hours a week, descale annually. Usage of less than 30 hours a week, descale every other year. If a coil begins to leak, it is sometimes possible to repair it by welding the leaking area. The area must be accessible for welding. If it isn’t, replace the coil. If the coil is old, replacement is recommended even if the leak is accessible. The coil is probably ready to leak in numerous other areas and the repair will not buy much time.